“Lectures on Faith” is a set of seven lectures on the doctrine and theology of the Church of Jesus Christ of Latter Day Saints, first published as the doctrine portion of the 1835 edition of the canonical Doctrine and Covenants, but later removed from that work by both major branches of the faith. The lectures were originally presented by Joseph Smith to a group of elders in a course known as the “School of the Prophets” in the early winter of 1834–35 in Kirtland, Ohio. So says Wikipedia. Wikipedia has some interesting info. The original title of each lecture was “Of Faith”. 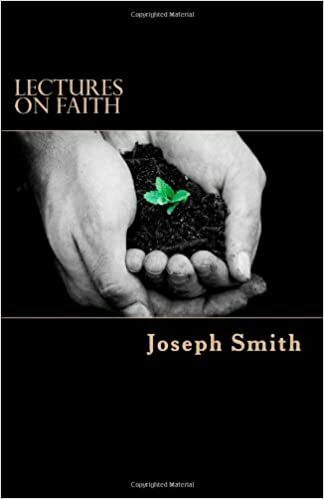 It was not until 1876, in an edition of the Doctrine and Covenants edited by Church Historian Orson Pratt of the Quorum of the Twelve Apostles of The Church of Jesus Christ of Latter-day Saints (LDS Church), that the title was given as “Lectures on Faith”. Possibly the most famous quotation is from Lecture 6:7: “A religion that does not require the sacrifice of all things, never has power sufficient to produce the faith necessary unto life and salvation”. The lectures were published in 1835 as the “Doctrine” portion of the volume entitled Doctrine and Covenants of the Church of the Latter Day Saints: Carefully Selected from the Revelations of God. The lectures were selected for that volume by a committee appointed on September 24, 1834, by a general assembly of the church to arrange the doctrines and revelations of the church into a single volume. That committee of Presiding Elders, consisting of Joseph Smith, Oliver Cowdery, Sidney Rigdon, and Frederick G. Williams, stated that the lectures were included “in consequence of their embracing the important doctrine of salvation,” and that the lectures, together with the church-regulatory sections that followed, represent “our belief, and when we say this, humbly trust, the faith and principles of this society as a body.” (See 1835 D&C, Preface.) Accordingly, the church body accepted the committee’s compilation on August 17, 1835, as “the doctrine and covenants of their faith, by a unanimous vote” (History of the Church 2: 243–46). Some Latter Day Saint denominations have subsequently removed the lectures from the Doctrine and Covenants. The lectures were removed from the Reorganized Church of Jesus Christ of Latter-day Saints version of the Doctrine and Covenants in 1897, although that denomination began publishing the lectures in a separate volume in 1952. The LDS Church removed the lectures from the Doctrine and Covenants in the 1921 edition, with an explanation that the lectures “were never presented to nor accepted by the Church as being otherwise than theological lectures or lessons”. (See Introduction, 1921 edition.) This is in contrast to the remaining pages of the original Doctrine and Covenants, which are officially recognized by nearly all Latter Day Saint denominations as divine revelation given specifically to the church. “(a) They were not received as revelations by the prophet Joseph Smith. “(b) They are instructions relative to the general subject of faith. They are explanations of this principle but not doctrine. “(c) They are not complete as to their teachings regarding the Godhead. More complete instructions on the point of doctrine are given in section 130 of the 1876 and all subsequent editions of the Doctrine and Covenants. Revision [of the Doctrine and Covenants] continued through July and August 1921, and the Church printed the new edition in late 1921. The committee proposed to delete the ‘Lectures on Faith’ on the grounds that they were ‘lessons prepared for use in the School of the Elders, conducted in Kirtland, Ohio, during the winter of 1834-35; but they were never presented to nor accepted by the Church as being otherwise than theological lectures or lessons.’ How the committee came to this conclusion is uncertain. The general conference of the Church in April 1835 had accepted the entire volume, including the Lectures, not simply the portion entitled ‘Covenants and Commandments,’ as authoritative and binding upon Church members. What seems certain, however, is that the interpretive exegesis of 1916 based upon the reconstructed doctrine of the Godhead had superseded the Lectures. Other commentators have theorized that the lectures represented official church doctrine in 1835, but that by 1897 or 1921, when the work was decanonized by the major Latter Day Saint denominations, the doctrine concerning the Godhead had changed, and the lectures were no longer generally consistent accepted doctrines. For instance, in Lecture 5, paragraph 2, it defines the Father as a “personage of spirit, glory and power,” whereas in section 130 of the Doctrine and Covenants, verse 22 states that “the Father has a body of flesh and bones as tangible as man’s.” In addition, the Father and Son are said to possess the same mind, “which mind is the Holy Spirit” (Lecture 5, paragraph 2). The Holy Spirit is not a personage, as defined at the beginning of paragraph 2: “There are two personages who constitute the great, matchless, governing and supreme power over all things …. They are the Father and Son.” This could cause confusion when compared with section 130 of the Doctrine and Covenants: “The Holy Ghost has not a body of flesh and bones, but is a personage of Spirit.” Section 130 was added in the 1876 edition and hence co-existed with the Lectures on Faith. During a recent wheatmeister poll it was noted that Lectures on Faith was de-canonized, I purchased a copy to read the lectures for myself. The book is rather short, and I read it over an hour flight. It definitely reads differently than the D&C and other scriptures, but quotes the Bible liberally. Each paragraph is numbered, similar to verses. Reason (c) above was interesting. I noticed a few times in Lecture 2 that there were a few references that seemed to refer to trinitarian doctrine. Lecture 2: 2 – “We here observe that God is the only supreme governor and independent being in whom all fullness and perfection dwells; who is omnipotent, omnipresent, and omniscient; without beginning of days…. Q. Is there a being who has faith in himself independently? Lecture 5 seems to confirm trinitarian ideas a bit. Lecture 5:2 – There are two personages who constituted the great, matchless, governing, and supreme power over all things–by whom all things were created and made that are created and made, whether visible or invisible; whether in heaven, on earth, or in the earth, under the earth, or throughout the immensity of space. They are the Father and the Son: The Father being a personal of spirit, glory, and power, possessing all perfection and fullness. The Son, who was in the bosom of the Father, a personage of tabernacle, made or fashioned like unto man, or being in the form and likeness of man–or rather, man was formed after his likeness and in his image. He is also the express image and likeness of the personage of the Father, possessions all the fullness of the Father, or the same fullness with the Father, being begotten of him; and was ordained from before the foundation of the world to be a propitiation for the sins of all those who should believe on his name; and is called the Son because of the flesh–and descended in suffering below that which man can suffer, or in other words, suffered greater sufferings, and was exposed to more powerful contradictions than any man can be…. Is this why it was jettisoned from canonization in the D&C? Q. Where do you find the revelations which give us this idea of the character of the Deity? A. In the Bible and Doctrine and Covenants and they are quoted in the third lecture (Lecture 3:9-11). There were some good quotes in there too. There is the idea that doubt cannot exist with faith. Lecture 6:12 … where doubt and uncertainty are, there faith is not, nor can it be. For doubt and faith do not exist in the same person at the same time. So that persons whose minds are under doubts and fears cannot have unshaken confidence; and where unshaken confidence is not, there [sic] faith is weak; and where faith is weak, the persons will not be able to contend against all the opposition, tribulations, and afflictions which they will have to encounter in order to be heirs of God, and joint heirs with Christ Jesus; and they will grow weary in their minds, and the adversary will have power over them and destroy them. Lecture 7 had some cool quotes as well. Lecture 7:3 – Let us here offer some explanation in relation to faith that our meaning may be clearly comprehended. We ask then, what are we to understand by a man’s working by faith? We answer, We understand that when a man works by faith he works by mental exertion instead of physical force. It is by words instead of exerting his physical powers, with which every being works when he works by faith. God said, “Let there be light; and there was light” (Genesis 1:3). Joshua spake, and the great lights which God had created stood still. Elijah commanded, and the heavens were stayed for the space of three years and six months, so that it did not rain. He again commanded, and the heavens gave forth rain. All this was done by faith, and the Savior says, “If ye have faith as a grain of mustard seed, ye shall say unto this mountain, Remove hence to yonder place; and it shall remove (Matthew 17:20); or “ye might say unto this sycamine tree, Be thou plucked up by the root, and be though planted in the sea; and it should obey you: (Luke 17:6). Faith then works by words, and with these its mightiest works have been, and will be, performed. As I read from the pages, what struck me was how important faith is to miracles, visions, etc. It made me wonder if we have no miracles because we don’t emphasize faith anymore. Could this be why church seems so dead? I mean I don’t hear this kind of stuff very often any more, and when someone says you can move mountains to yonder place, does anyone actually believe (or have faith) that such a thing can happen? Lecture 3:10 referred to the “Book of Commandments,” a precursor to the Doctrine and Covenants. The Book of Commandments was planned as a compilation of Joseph Smith Jr.‘s early prophecies. Smith, leader of the Latter Day Saint movement, gathered several of his revelations for a High Priest’s council in November 1831. The ten-man council voted to print 10,000 copies, but the actual number of prints was reduced to between three and five thousand. W. W. Phelps publisher of the book, ran a press in Independence, Missouri. A faithful Mormon, Phelps also edited an historically important Mormon periodical, The Evening and Morning Star from September 1831 to July 1833. Most revelations in the Book of Commandments were previously published by Phelps in the Star. On July 20, 1833 an anti-Mormon and pro-slavery mob destroyed the press. The mob, purportedly frightened of Mormon political power, was incensed by an editorial in Phelps’ Evening and Morning Star perceived to be abolitionist. Breaking down the door, they razed Phelps’ home and business in less than an hour. At that point, 65 revelations of the Book of Commandments, about two thirds the total, were already printed. Totaling 160 pages, most of the uncut and unbound sheets were destroyed in the ensuing fire. However, some neighbors including teenage sisters Caroline and Mary Elizabeth Rollins saved remnants of nearly 100 copies. Fewer than 30 are known to exist today, including several incomplete versions. Further enhancing the book’s scarcity, several copies of the Book of Commandments are held in permanent collections. For example, The Church of Jesus Christ of Latter-day Saints (LDS Church) and the Community of Christ have multiple copies, and the rare books divisions of the University of Utah Marriott Library, Brigham Young University Harold B. Lee Library, and the New York Public Library each own a copy. When sold on the open market, the book regularly fetches over $100,000. An incomplete copy changed hands for $200,000 in 2001, and a complete volume sold at auction for $391,000. Rare books dealer Ken Sanders claims a copy was sold privately in Utah for $500,000. Have you read the Lectures on Faith? What are your thoughts? Why do you think the church de-canonized the Lectures on Faith? Does it teach false doctrine concerning God? Have you found faith promoting/inspiring parts of the Lectures on Faith? Could Lectures 2 &5 have been modified or removed, leaving the others set of lectures alone in promoting faith? On 17 April 1920 Elder James E. Talmage of the Quorum of the Twelve took a train to Eureka, Utah with the intent of investigating alleged activities by a group of “Separatists” that had come to the attention of the First Presidency. The next day in his journal he wrote “…I had occasion to investigate the alleged organization of a body of people who are said to have claimed that the time had arrived for the establishment of the United Order and that they were the ones to start the movement. I found that the rumors and reports that have reached the First Presidency concerning this matter have been greatly exaggerated. The so-called ‘movement’ is confined to the people belonging to the West Tintic branch, not more than forty families in all, under the supervision of Brother Moses Gudmundsen as presiding Elder. It appears that before the organization of the branch Brother Gudmundsen and a few relatives, together with some other interested people took up a tract of land and tried to establish a system of cooperative farming. Their motives appear to have been good; but others have come in who claim to have received divine manifestations that this marked the beginning of the re-establishment of the United Order and that they were commanded to enter it. Since the organization of the branch, Church rules have been observed so far as I could learn.” Moses Samuel Gudmundsen (1879 – 1964), was the leader of the group, Branch President, and professionally was a music instructor at Brigham Young University. During the period of dealing with the West Tintic group, Talmage was involved as a member of the Book of Mormon committee which provided the then updated headings and footnotes to the Book of Mormon along with double columns. On 11 March 1921 Talmage writes that “…the Book of Mormon committee assembled this morning to consider the advisability of revising and reissuing the Doctrine & Covenants…The footnotes and references require revision, and in places amplification; and the need of an adequate index has been long and keenly felt.” Talmage headed this committee which consisted of him, and Elders Joseph Fielding Smith and John A. Widtsoe. That same day Talmage also wrote “During the afternoon I had a long interview with one of the presidency of the Tintic Stake, and with others concerned in the investigation of West Tintic affairs.” There were additional trials held and more members of the West Tintic group were either excommunicated or disfellowshipped. The actions of the West Tintic Branch, taking place as this committee was considering revamping the Doctrine and Covenants, begs the question; Did the West Tintic group with their emphasis on “the sacrifice of all things,” which devolved into “wife sacrifice,” contribute to the decision to remove the Lectures on Faith from that book of scripture? (a)	They were not received as revelations by the Prophet Joseph Smith. (b)	They are instructions relative to the general subject of faith. They are explanations of this principle but are not doctrine. (c)	They are not complete as their teachings regarding the Godhead. More complete instructions on this point of doctrine are given in section 130 [verse 22] of the 1876 and all subsequent editions of The Doctrine and Covenants. (d)	It was thought by Elder James E. Talmage, chairman, and other members of the committee who were responsible for their omission that to avoid confusion and contention on this vital point of belief, it would be better not to have them bound in the same volume as the commandments or revelations which make up The Doctrine and Covenants. Thanks for the info Jim. It seems mind-boggling that they would de-canonize based on a small fringe group. I’ve never believed the commonly quoted statement about requiring the sacrifice of all things. If this is true, then lots of Mormons, including most GAs will not be saved, because they haven’t sacrificed all things. And don’t start in about being “willing” to sacrifice all things. That’s not what the Lectures say. The Lectures on Faith were dumped because they are theologically problematic. Nice summary, though. Do we not agree to sacrifice all things in the Temple? It’s required of us yet we do not have to do it.